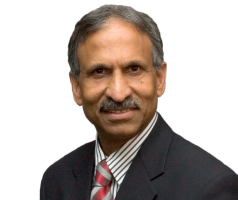 Subbarao Inampudi, MD joined Consulting Radiologists, Ltd. (CRL) in 1981. He is a past President of CRL, and a well-respected member of the medical community, both locally and throughout the upper Midwest. He was a founding member of the Abbott Northwestern Clinic Council, and remains active in numerous community organizations. Nominated by his peers, Dr. Inampudi has been recognized as one of Mpls-St.Paul Magazine’s “Top Docs” for over a decade. It was stated that he is a practitioner whom other medical professionals would trust to care for their own family members. Dr. Inampudi received his MBBS medical degree at Sri Venkateswara University in India. He completed his Radiology residency and Vascular Radiology fellowship at Mount Sinai School of Medicine, New York, NY. His previous leadership roles at Abbott Northwestern include serving as Chief of Staff, and Chair of the Quality Committee on the Allina Board.